Digital Design is a two-year course that takes students through the aspects of digital film editing, planning and producing documentaries, digital photography, web page design and publishing. 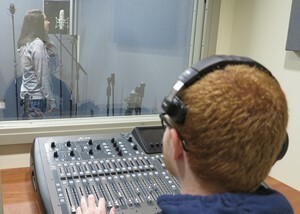 Students will also be exposed to the performing arts, learn interviewing skills, learn to set up a set for a photo shoot, adjust set lighting, work with audio recording and broadcasting. This course is aligned with curriculum at Sinclair Community College. 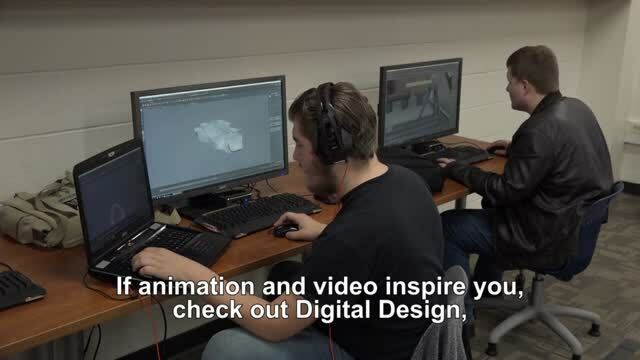 Qualified students earn up to 18 college credits while in the high school course, and a $3,000 scholarship to continue their education in the Digital Design/Multimedia field at Sinclair. Students have the opportunity to serve in an internship related to their field of interest in their senior year and may also be eligible for early job placement the second half of their senior year. Criteria for placement include instructor recommendation, grade point average and attendance. Students in Digital Design on our main campus participate in SkillsUSA, a partnership of students, teachers and industry, working together to ensure Americal has a skilled workforce. Students in Digital Media Arts satellite programs participate in Business Professionals of America, an organization committed to the preparation of global professionals through the advancement of leadership, citizenship, academic and technological skills. All students also have the opportunity to participate in Tech Prep Showcase through the Miami Valley Tech Prep Consortium. Contact Instructor Greg Beasley at 513-932-5677 ext. 5336 or greg.beasley@mywccc.org. Satellite Digital Media Arts programs located at Springboro High School, instructor Justin Deeter, Justin.Deeter@mywccc.org; Little Miami High School, instructor Brian Shoff, brian.shoff@mywccc.org and Kings High School, instructors Kelly Shields, kelly.shields@mywccc.org and Cassandra Barnes, cassandra.barnes@mywccc.org.